The West Elementary School space program launches “Lunar Cats” and new technologies. The year was 1989, cell phones cost nearly $4000, wireless technology and the World Wide Web were in their infancy, and Intel had just released its “fast” 486 processor. 1989 was also significant for a group of teachers and students at Zion District 6, West Elementary School (Illinois) as it launched its first simulated space program. This space program took a group of highly motivated students and simulated a mission to the moon that included the launch of a spacecraft, mission control, a space habitat and splashdown. The students would stay overnight in a space capsule and complete science experiments. The student astronauts from 1989 used VHS video cameras with yards of extension cords to connect with mission control and the space capsule. In 2010 mission control was linked to the space capsule using wireless cameras. This enabled the Lunar Cat astronauts to speak and see their counterparts in mission control. The ground missions in 1989 were accomplished using remote controlled toy trucks. This year they used a Lunar Rover manufactured from a Boe-Bot robot [A microcontroller operated mobile robot. — Ed.] that could be remotely controlled from inside the space module. “Technology” says Dr Ahlgrim, “has really helped this project take on a new life from back in the day, and creates endless opportunities for future missions!” He is spot on. Two high tech pieces of equipment were used during the mission and the “Lunar Rover” was a key component. The Mars rover was developed by Mark Spencer, WA8SME, for the ARRL Education & Technology Program (ETP). 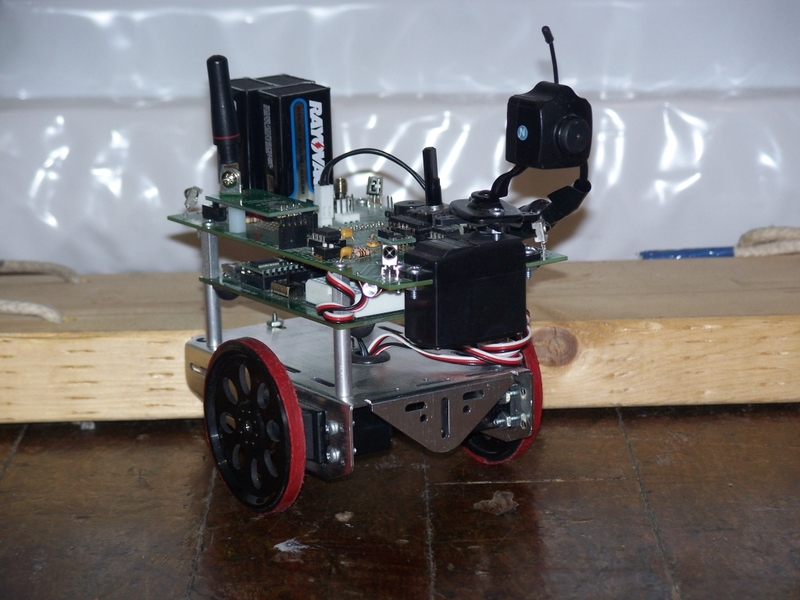 He used a Boe-Bot robot from Parallax, Inc for the rover for this project.1 The rover was fitted with a LYD Mini Wireless Camera equipped with a 2.4 GHz radio receiver. The receiver was connected to an LCD projector in the Lunar Module. The camera was connected to a servo on the front of the lunar rover, which was programmed to move by pressing specific buttons with a simple TV remote control. One of the more advanced pieces of technology we integrated into the space experience was the CubeSat Simulator. Also developed by Mark Spencer, WA8SME, for the ARRL ETP, it provides an affordable resource to simulate satellite operations in the classroom. It will soon be available to other schools through the ETP grant program. Using the simulator, the junior astronauts and mission control personnel were trained on how to operate and take readings for this mission. Each student was able to experience simulated satellite operations in the classroom by recording satellite telemetry transmissions in either binary format or Morse code to better prepare them for “live” telemetry transmissions from spacecraft. Additionally, each student completed extensive research on how satellites operate and on typical satellite designs. Our students have just touched the surface of how much mathematics, science and technology can be introduced with these resources as part of the school district’s curriculum. (If you want to see how Illinois math standards correlate with teaching curricula introduced through the robotics program, you’ll find that information posted within the ARRL Education & Technology Program pages of the ARRL Web site.). If you are a teacher, or would like to see one of your children’s teachers using this type of advanced technology in your school, I encourage you to refer them to the ARRL ETP. This education outreach project is designed to introduce teachers to Amateur Radio as an instructional resource and to provide an educationally sound curriculum focused on wireless communications. The goal is to offer the resources to build a foundation of wireless technology literacy among teachers and students. The Teachers Institute (TI) program is a professional development opportunity within the ARRL Education & Technology Program. For teachers the workshop is very inexpensive. The ETP makes a variety of resources available to schools and school teachers to help integrate wireless technology into school curricula using ham radio as an educational tool. For more information use these links, ETP or TI, or you can contact ARRL at etp@arrl.org. Photos by Nathan McCray, K9CPO. Nathan McCray, K9CPO, is currently an ETP lead instructor for the ARRL. He is a former sixth grade teacher who moved on to be an assistant principal at West Elementary School in Zion in Lake County, Illinois. He is currently serving his first year as the Principal of Edward Bain School of Language and Art in Kenosha, Wisconsin. As a teacher, Nathan integrated Amateur Radio, electronics and robotics into his science and math curriculum. He plans to start an Amateur Radio club in his new school and is looking forward to developing clubs in his district's junior high and high schools. His knowledge areas include electronics, computer programming, communications, Amateur Radio, computer systems, leadership and teaching. Nathan’s background includes instruction at the community college level, as well experience as a senior instructor at a US Navy technical school. He has been licensed for over 25 years and holds an Amateur Extra class license. He is married to Michelle McCray, N4NRN, and has two children. 1Boe-Bot kits are available from the ARRL store, ARRL order no. 1223. Telephone toll-free in the US 888-277-5289, or 860-594-0355, fax 860-594-0303; www.arrl.org/shop; pubsales@arrl.org. News & Features >> Features and Columns >> Features Archive >> Blast Off!